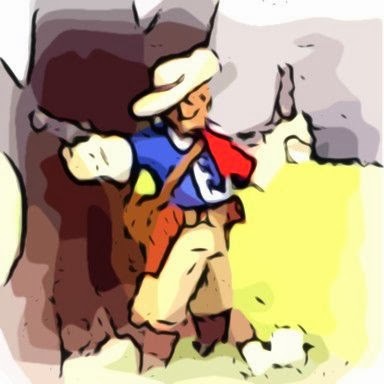 My fourth submission to Curt's Fourth Painting Challenge was Comanche, one of the few survivors of Custer's Battalion (C, E, F, I and L Companies, 7th Cavalry) at the Battle of Little Bighorn. My 7th Cavalry work is as extensively researched as I can get. I try to pick figures that match the descriptions and photos of the men of the 7th. I consult They Died With Custer: Soldiers’ Bones from the Battle of the Little Bighorn, Archaeology, History, and Custer's Last Battle: The Little Big Horn Reexamined, and Men with Custer: Biographies of the 7th Cavalry : June 25, 1876 looking for descriptions of skin color, hair color, stature, date of enlistment and service record before I do any painting. Comanche was no exception. Comanche was purchased for $90, the going rate for Army remount purchases. He was captured somewhere on the southern Great Palins, taken to St. Louis, and sold to the Army. He went through breaking in at the remount station, then was shipped to Ft. Leavenworth, and part of a batch of 41 horses selected by LT Tom Custer for the 7th. At Ellis Station, he was selected as the personal mount of Capt Myles Keogh. There is some controversy as to how Comanche got his name. The most widely accepted story is that on September 13, 1868 Capt Keogh was involved in a skirmish with a band of Comanche Indians. During the fight the horse was wounded by an arrow in the right hind quarter. The arrow was later removed, and the wound healed. After the battle, a trooper who witnessed the incident claimed that when the arrow struck, the horse "yelled just like a Comanche" If this were true, then Comanche would have been in Keogh's possession for over four months without having been assigned a name. This seems to be an unlikely scenario, as just with a newborn infant, a name or method of identifying the child is quickly established. Another story might explain the naming delay. So it goes, Keogh was on a scouting mission near Fort Larned, Kansas. During a skirmish with the Comanches, Keogh's horse was killed. Supposedly his Lt. dismounted one of the enlisted men and turned the mount over to Keogh, who kept the horse from that point on. The horse was then named Comanche, and became Keogh's favorite mount from that point on. It is stated that at that time, with the exception of the officers' horses, it was not customary to give names to cavalry horses. Comanche missed many of the major battles of the 7th before the Little Bighorn Campaign. In 1867, Keogh served as the CO of Fort Wallace. 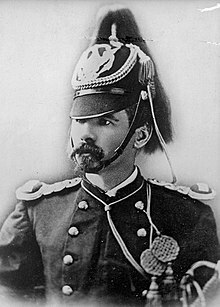 During the Washita campaign, Keogh was on the staff of BGEN Alfred Sully. Keogh and Comanche were at Fort Totten, assigned to the International Boundary Commission, and was on leave for the 1874 Yellowstone expedition. After the Battle of the Little Bighorn, Comanche was found on the battlefield, put on the Far West with the rest of the 7th Cavalry's wounded, and nursed back to health at Fort Abraham Lincoln. "Headquarters Seventh United States Cavalry, Fort A. Lincoln, D. T., April 10th, 1878. General Orders No. 7. (1.) The horse known as 'Comanche,' being the only living representative of the bloody tragedy of the Little Big Horn, June 25th, 1876, his kind treatment and comfort shall be a matter of special pride and solicitude on the part of every member of the Seventh Cavalry to the end that his life be preserved to the utmost limit. Wounded and scarred as he is, his very existence speaks in terms more eloquent than words, of the desperate struggle against overwhelming numbers of the hopeless conflict and the heroic manner in which all went down on that fatal day. (3.) Hereafter, upon all occasions of ceremony of mounted regimental formation, 'Comanche,' saddled, bridled, and draped in mourning, and led by a mounted trooper of Company I, will be paraded with the regiment. 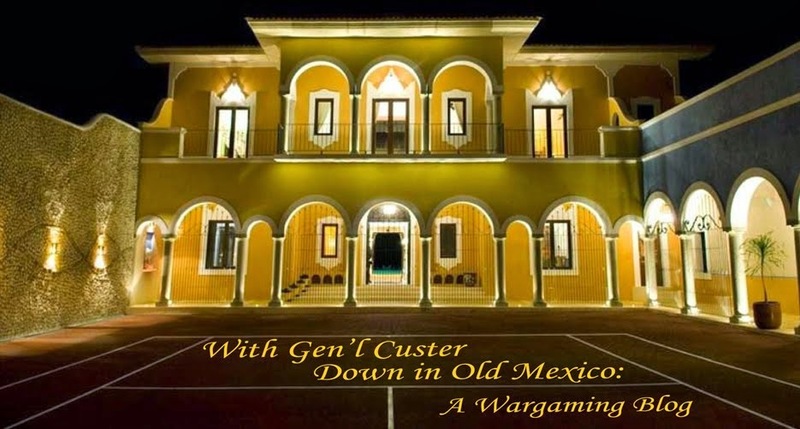 By command of Col. Sturgis, E. A. Garlington, First Lieutenant and Adjutant, Seventh Cavalry." The reasons for Col. Sturgis' order may have been as much to bring peace to his household as much to honor Comanche. Supposedly, one of Col Sturgis' daughters convinced Comanche's keeper to let her ride him. Later, the daughter of another officer also prevailed upon Comanche's keeper to allow a ride, which enraged Col. Sturgis' daughter that her special status had been breached. Comanche served with the regiment during their time at Fort Meade, and with the Regiment when they moved to Fort Riley. He had the freedom of the post, would form up with Company I during parades, and was named the Regiment's "Second Commanding Officer." He formed a bond with his keeper, Pvt Gustave Korn, and they became inseparable - with Comanche even leaving the post to go look for Korn, if Korn had not returned to the post in time for nightly feeding. Here's where Comanche's story takes the sad turn. Korn was killed at the Battle of Wounded Knee, and Comanche never recovered. He lingered on through 1891, until dying of colic - or, perhaps, a broken heart. The members of the Seventh were devastated, and Comanche remains one of two horses given a funeral with full military honors. Comanche was preserved by Professor Dyche of the University of Kansas, for $400 and the right to display him at the 1893 Exposition in Chicago. For reasons unknown, the officers of the Seventh could not pay the $400, and so Comanche remains on display at the University of Kansas. 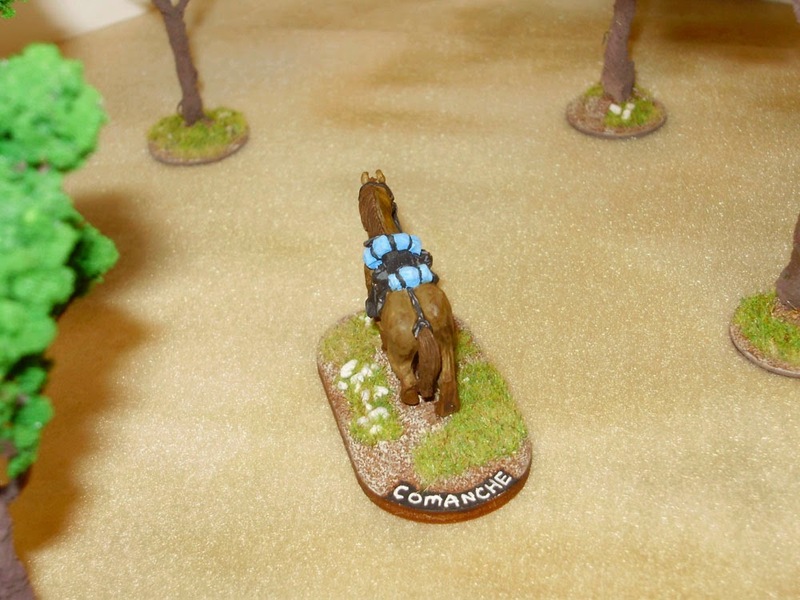 Comanche was supposed to be my entry for the casualties bonus round, but I wasn't pleased with the paint job. There were a few paint bubbles - which have plagued me the entire competition - and some bits where the paint didn't take. So I waited, and submitted him on his own. 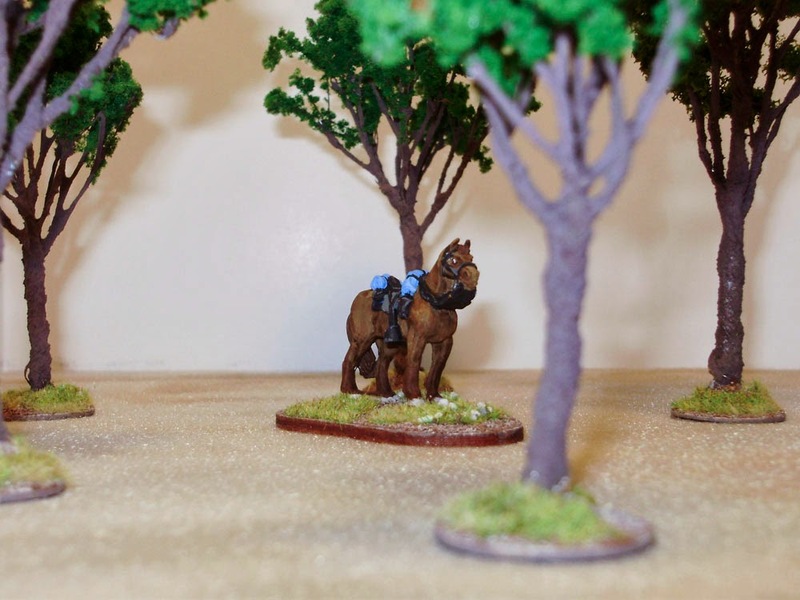 There is a dearth of horse holder options for the Plains Wars, so I have been forced to use ones for the ACW. The horse furniture is close enough, and probably accurate for the 1860s and 1870s. The uniforms of the horse holders, mounted (Perry) or dismounted (Sash and Saber) are in the low-cut shell jacket worn by cavalry in the Civil War and the 1860s and early 1870s as Civil War stocks were expended. By 1876, most US Cavalrymen would be wearing tunics. More problematic is that both mounted and dismounted figures carry their sabers, which were expressly proscribed for the Little Bighorn Campaign. I ended up choosing a Sash and Saber horse for Comanche for two reasons. 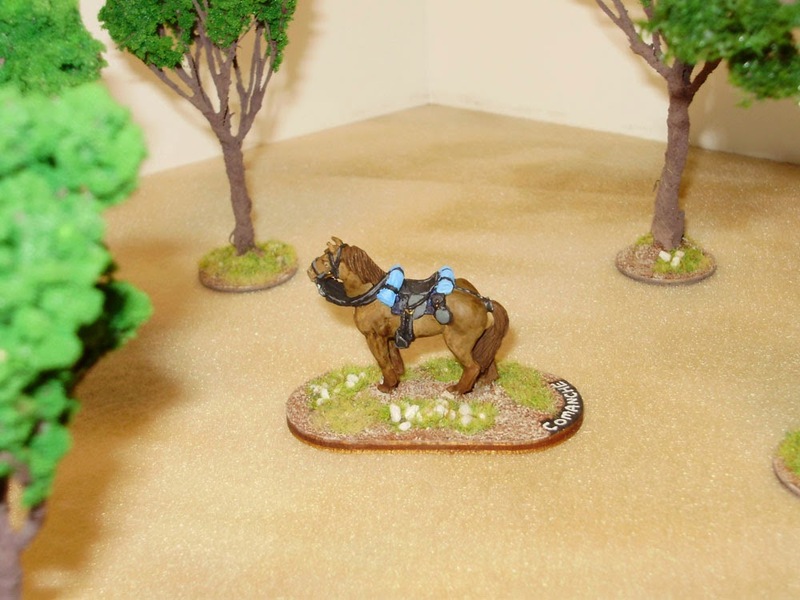 First, I chose the Sash and Saber horse specifically for the military bearing the horse sculpt has - tall chest out, proud eyes, front, standing tall. 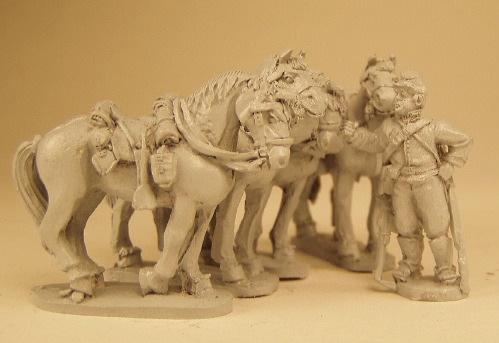 Second, Perry Miniatures are wonderful sculpts, but they have MAJOR issues with flash and clean-up. Comanche was described as a claybank in his interview with the Bismarck Tribune, but his official description labels him a "buckskin:"
However, buckskin is too light to match with the photographs. He's also referred to as a "light bay" and a "buckskin dun." I ended up using Reaper's Olive Skin Shadow for most of his hide, and Reaper Earth Brown where he darkens in the leg, his mane and tail. I then washed him with Vallejo's Sephia Wash to get the proper darkening, and I think I nailed it. It certainly looks very good, and I'll keep that in the repertoire, along with other brown and chestnut/red leather paint schemes I use for bay and chestnut horses. 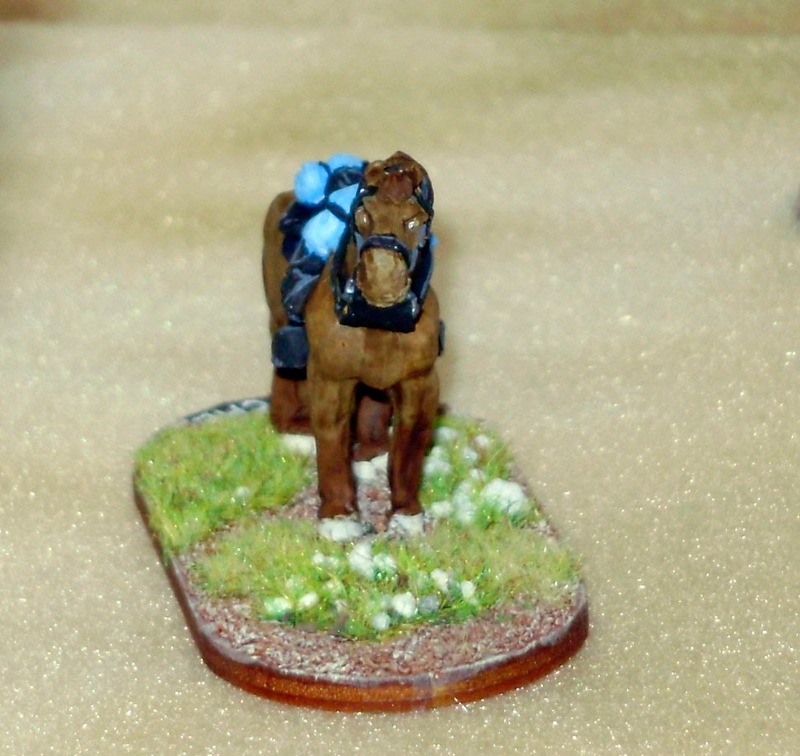 While the saddle bags/bundles look very sky blue in the pictures, they're actually Foundry Tomb Blue 23B over Delta Ceramicoat Sky Blue, and highlighted with a pale grey blue. Though the kersey is supposed to be darker, I like the faded, sun-bleached look, with just a hint of gray. All leatherwork is black, highlighted with a 1-1 mix of black and Vallejo salmon rose. Saddle blankets and canteen are Delta Ceramicoat Charcoal Gray, highlighted with Hippo Gray. 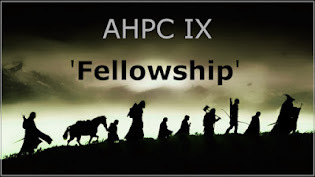 All are the same mixes I use with other members of the 7th Cavalry. And now here he waits, in the shade of the trees, for the Seventh to parade.